This is a classic, trendy and stylish choice good for all events. The high gloss black pearl finish on this beautiful, stylish and elegant Chrysler 300 limousine suits any occasion with a sense of distinction. The chrome wheels add a touch of style and highlight the beautiful shine of the paint. Enjoy the comfortable leather seating for up to 10 passengers with LED and fiber optic lighting set to the level you choose with a custom touch panel interface. 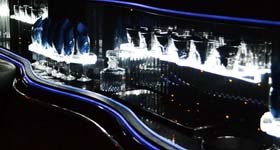 Ice is provided as well as champagne glasses and rocks glasses for your beverage of choice. 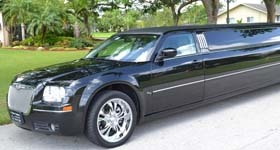 Fort Lauderdale based limousine service, serving all of your transportation needs.